NOTE: Transmidity Bag will not fit all large cigar boxes. These always help if you do not over night. Added the humidity bag for a couple of samplers I bought as a gift for my father in law, they stayed fresh as they day they arrived and were nice and fresh when I gave them to him 3 weeks later. I recommend adding the bag and will get it again, thanks. Figured it couldn't hurt. It didn't. Very pleased with the care and attention to detail BCP puts into shipping their orders. The humidity bags are just an added level of care to ensure my investment arrives as intended. Job well done. Great Product, it keep my Cigars fresh. Cool product. Works really good! Solid bag for storing loose sticks. A novel product, happy to possess one. Recommend it. The humidity bag is a great idea and should be part of the order for most cigars, just add it to the shipping. It really makes a difference in the enjoyment of the cigar. Great solution For humidity control. Keep cigars in original box, humidity bag in ziplock bag works great! Bag is a great idea. When I received it with my humidipack....the bag was left open. Everything arrived on time and very well packaged. I went ahead and added the Transmidity Humidity Bag to my recent order. Glad that I did. It protected my cigars while they sat on my front porch after deliver. The cigars were still in great shape when I put them in my humidor. Money well spent. worth every penny, Our order stayed super fresh during shipping. Came with my Saint Luis Rey purchase. Kept them fresh while in transit to SC. The humidity bag seems like a good investment of $3, when you consider what is protecting. I always purchase $200 worth of cigars; I'd hate good them to dried out while in transit. Cigars came super quick and well packed. They are nice and fresh. I will be buying again when i run out! I like the option of having my cigars shipped in the humidity bag. I don’t know how much difference it really makes in shipping a sealed cigar box but it makes me feel better. Also, because I don’t have a large humidifier I can store cigars temporarily in the bag. Cigars arrived in this bag, when I put them in my humidor it remained stable. Grabbed a handful & put them in the saddlebag of my Harley 3 day ride with perfect cigars. This bag is awesome, preserved my smokes! Just got the cigars and bag two days ago. So far so good. I always get one of these when I order cigars as I never know how long the order is going to take to arrive and under what conditions they are during their journey. Never had a problem with the cigars I ordered - always arrive fresh without any issues - when you are buying a box of cigars - the extra #3 bucks as insurance is not too bad. I added this to my order when it shipped. Comes with a water pillow and looks to be fairly durable. It's also quite large and I would think could accommodate a whole case of cigars. Excellent idea. Keeps cigars fresh longer than I expected. This should be an option from every distributor. We all have found the dried out boveda inside a box of cigars. That won’t do you much good. The humidity bag ensures your sticks arrive fresh. Holds a lot of cigars. Keeps them fresh for several days. Bag was well sealed and humidity packet was full and cigars were in good shape. I recently ordered a box of Nat Sherman Nicaraguan Timeless Edition cigars and requested shipping with the Transmidity Bag. I've previously used this option, and it keeps my cigars in humidor-like condition. I strongly recommend it! Well made and heavy duty bag works well. When a deal come up and your humidor is full you can safely protect your investment. This is a great product if you really value your cigars to be fresh. Good quality, keeps the sticks moist while I'm traveling from Cleveland to Philadelphia. The humidity bag kept my cigars fresh during shipping. It's well worth the couple extra dollars. Kept cigars fresh when sending to Florida heat in summer. I don’t know if they come in other sizes but the bag I got is way too large for use as a transport bag in luggage or in a carry on. It can easily hold 100 cigars. I will probably never use it. Excellent alternative for storing cigars while maintaining ideal humidity. These bags work great; I've sent 6 boxes of cigars to Arizona and they arrive fresh and ready to smoke! Big bag steal of deal. Bag kept the cigars pristine. I love that you can re-charge the pillow. Works Great with have cigars shipped across the country! This bag made sure my cigars arrived ready to smoke. Sometime when you order cigars online, you need to put them in the humidor for a couple of weeks in order to get moisture back into the leaves. But when I use the humidity bag during shipping, they are ready to smoke upon arrival. I think it’s a great idea. My hubby just took this on a trip that he wanted to pack some stogies for.....very handy! A very good Humidity bag, keeps cigar fresh while in transit. Also good if you are traveling. At times I need to bring a supply of smokes with me. This bag kept them just right. Recently, I have been having my cigars shipped using this product and I’m very happy that I have. My orders have arrived in excellent condition and are at the perfect humiy right out of the bag and box! Funny story, the delivery person who delivered my last order, dropped the order over my fence near my wife’s flower garden inches away from the automatic sprinkler system! WTH! Had it not have been in this shipping bag, my order would have been History; I’m pretty sure the bag wasn’t designed for such an event but it’s sure a relief to know that on rainy delivery days, my cigars will, “will weather the storm”... if I’m not home to grab them! The humidity bag worked during an extended trip. Perfect. This work don't good for the shipment to me because of the extreme heat in the transportation process. Kept my cigars fresh for a two week trip. Kept cigars fresh durin shipment. I get these bags bags for a variety of reason, but at the top of the list is for my travels. I do a lot of traveling for my job and like to take a few cigars with me. One bag is more than sufficient to keep my cigars fresh in my travel case for my travel duration. I pack 10 cigars in my travel kit and have no worries of staying away from my home humidor for 2 to 3 weeks. Great item to have. I’ve been ordering these for a while. I’m hoping they increase smokability right out of the mailbox. So far so good! They’re also great to reuse when I send friends and family home with ziplock care packages of a few sticks. Works great...I can now leave a couple of smokes in the workshop! Great product! Very happy with this bag, it is fantastic for storage and packing in luggage for travel. Would buy again. I chose the his option as order was arriving while I was away, it kept the cigars in perfect condition. I had been ordering my stock from a different company but while online I noticed BCP's prices were lower. I decided to give them a try and am glad I did. I also decided to try the humidity bag they offered for shipping. My cigars arrived promptly, just in time for a two week Florida trip. My cigars kept nicely for the two weeks in the humidity bag. Convinced me. From now on, all my orders from BCP will be shipped in one of their humidity bags. While shipping industry is continuously improving you still can not control 100% the shipping time and the environment during transit. 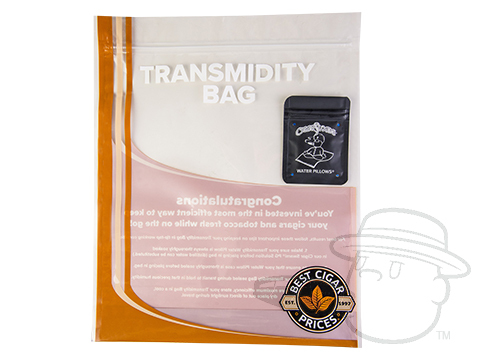 The Transmidity Humidity Bag protect your cigar for drying during shipping. Great product! Great product for traveling or just keeping your cigars in perfect condition. Great way to travel and keep your cigars safe. I use it frequently and enjoy all the benefits! Best Cigar Prices has the Best Customership! Love the Java Corona Maduro. Mild and flavorful, but the "best" part of Best Cigar Prices is the customer service! Fast, responsive, efficient and courteous!! The humidity bag is a great, inexpensive solution. Bag is great. Came with reusable humidifier pouch. I use it when I am traveling. Excellent. I have started purchasing the humidity bags, and it really keeps the cigars fresher during the shipping process. Give it a try! I travel long distance and have always put my cigars in Ziploc bags to contain the humidity. Airplane cabin and cargo-hold air is reheated from -50 C (outside air) and this is extremely dry. Then Best cigar prices came out with this much tougher bag that includes a humidity pouch. This is the only thing I use now and I use them all the time. Makes a great temporary humidor away from home. Great item, use it all the time for spare cigars. It keeps my cigars fresh! i think they are a good ide3an when you are buying a number of individual cigars or samplers ... , however for boxes of cigars or the Villigers which are vaccum packed there is no need . very big enough to hold cigar box. This is perfect when you travel or your humidor is to full just yet! My package of Cigars was held at the post office for an extra 2 weeks. But the cigars still arrived soft and supple. So glad I added it to my order. Very nice smooth smoking cigars. they have a nice burning silver ash. smoking them does not even leave smelling like a cigar factory. I enjoy them greatly. Helps with keeping your cigar s fresh. It did for me, like a portable humidor. Cigars stay fresh anywhere you go. These are a small investment to keep my cigars ‘fresh’. I get one with every cigar order. This bag was a small investment to protect the delicious cigars sent to me. It worked really well and I will use it over and over when I travel. I use this as a temporary humidor! It’s large enough to hold a box of cigars plus it’s durable and holds humidity well. Everything is always as represented, quality and price are the best that I have found. I have been buying from BCP for the last 10 years! I received the cigars in a timely manner. The condition of the cigars are great! I thought this was great I’ve ordered with and without the bag. From now on my orders will always include the humidity bag!! Transmidity Humidity Bag is rated 4.5 out of 5 based on 189 customer ratings. The Transmidity bag will last indefinitely, as the water pillow inside can be recharged as many times as needed using our Swami PG Potion. In ideal conditions, the water pillow can last as long as six months before needing a recharge. In order to recharge the water pillow simply follow the instructions on the bag. You will know when it needs to be recharged, as it will feel stiff and dry. The internal dimensions are approximately 13" L x 11" W and it expands up to around 6 and a half inches. You can fit a whole box of cigars inside without removing them from the box, or you can fit multiple boxes if the cigars are removed.